For example, James is a web developer running a web-based video content management service. Users of his service are content owners that live encode sports broadcasts. By integrating Azure Media Clipper into his web service, James enables his content owners to create sports highlights from their media catalog. Content owners can select one or more live or VOD sports broadcasts, specify which segments they want to clip, and submit the clipping job. After the job is processed, the content owners get back a clip for publishing or distribution through social media or other platforms. Azure Media Clipper takes as input a JSON representation of the assets hosted in your media services account. This JSON contract that you must generate contains all of the required metadata needed to playback the asset and parse its manifest. No rendered media is passed directly to the Clipper. 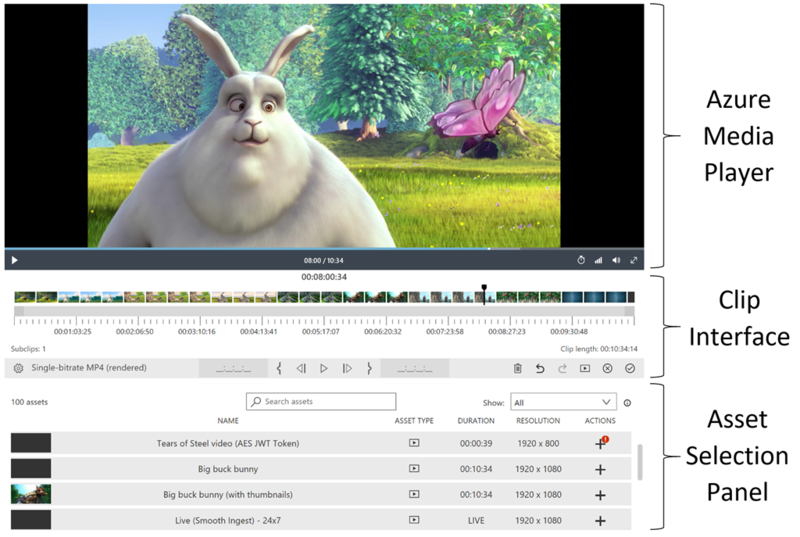 Supported assets include AMS single-bitrate MP4s, multi-bitrate MP4s, and dynamic manifest filters. At this time, Clipper does not support media hosted outside of Azure Media Services. In the first case, you pass in a static set of assets. Each asset includes its AMS asset ID, name, published streaming URL, AES or DRM authentication token (if applicable), and optionally, an array of thumbnail URLs. The thumbnails will be populated into the interface, if passed in. In scenarios where the asset library is static and small, you can simply pass in the asset contract for each asset in the library. To create a clip, drag and drop an asset onto the clip interface. For clipping against multiple assets, drag and drop multiple assets into the clip interface from the asset selection panel. You can select and reorder assets in the interface to the desired order. The asset selection panel provides asset duration, type, and resolution metadata for each asset. Use the buttons on the clip interface to find mark times. To preview the output of the clipping job, select the preview button and the clip will playback from the selected mark times. Dynamic manifest filters describe a set of rules based on manifest attributes and asset timeline. These rules determine how your streaming endpoint manipulates the output playlist (manifest) and can be used to change which segments are streamed for playback. The filters produced by the Clipper are local filters and are specific to the source asset. Unlike rendered clips, filters are not new assets and do not require an encoding job to produce. They can be create very quickly via our .NET SDK or REST API, however, they are only GOP-accurate. Typically, assets encoded for streaming have a GOP size of 2 seconds. To create a dynamic manifest filter, select dynamic manifest filter as the clipping mode from the advanced settings menu. You can follow the same process to produce a clip to create the filter. Filters can only be produced against a single asset. Note: Only HTML5 playback of streams from Azure Media Services is currently supported. You can extend the set of supported languages, in addition to the languages supported by default. Azure Media Services will continue to grow and evolve, adding more features, and enabling more scenarios. To help serve you better, we are always open to feedback, new ideas, and appreciate any bug reports so that we can continue to provide an amazing service with the latest technologies. To request new features, provide ideas or feedback, please submit to User Voice for Azure Media Services. If you have any specific issues, questions or find any bugs, please post your question to our forum or reach out to us directly through amcinfo@microsoft.com.